Bundled Payments: What are the Essentials You Need to Know? Bundled payments are likely to become more commonplace in the healthcare industry. Bundled payment methodologies are being used to incentivize improved care coordination, quality, patient safety, and cost efficiency in a system that is badly in need of improvements in these areas. 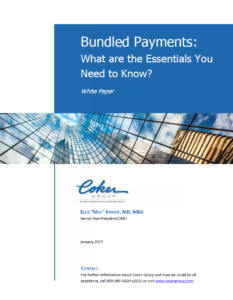 This paper outlines the mechanisms underlying bundled payments and helps guide providers who may be considering this payment model to optimize their performance by mastering certain key capabilities. Readers gain an understanding of bundled payment methodologies, how their uses affect healthcare organizations, and how to incorporate the needed capabilities to maximize effectiveness and efficiency under this payment model.